What is Elastic Material ? A material which regains its original size and shape on removal stress is said to be elastic stress. What is Plastic material ? A material which can undergo permanent deformation without rupture aid to be plastic material. This property of the material is known as plasticity. Plasticity is important when a material is to be mechanically formed by causing the material to flow. 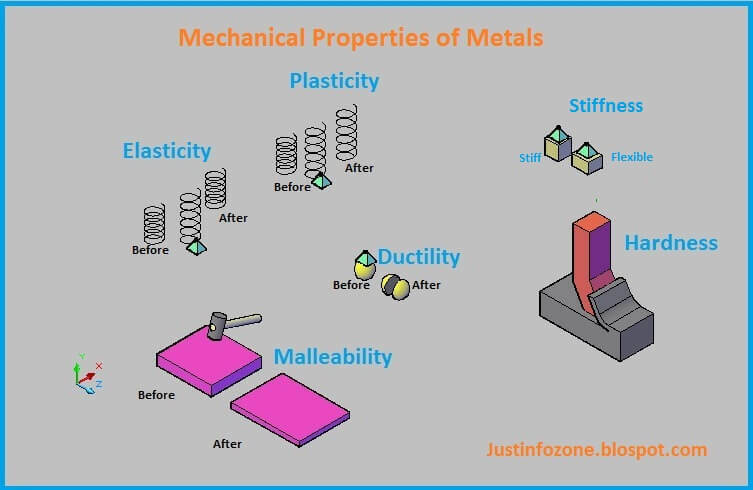 What is Ductile Material ? A material which an undergo considerable deformation without rupture is said to be ductile material. The major portion of deformation is plastic. What is Brittle Material ? A material which ruptures with little or no plastic deformation is said to brittle materials. What is Elastic limit ? The greatest stress that a material can take without permanent set on the removal of stress is known as elastic limit. What is Endurance limit or Fatigue limit ? The greatest stress, applied infinite number of times, that a material can take without causing failure is known as endurance limit or fatigue limit. What is Modulus of Resilience ? The energy stored per unit volume at the elastic limit is known as modulus of resilience. What is Modulus of Toughness ? The amount of work required per unit volume to cause failure, under static loading, is called modulus of toughness. What is Modulus of Rupture ? The ultimate strength in flexure or torsion is known as modulus of rupture. What is Strain hardening ? The increase in strength after plastic zone due to rearrangement of molecules in the material. What is Proof stress ? The stress which is just sufficient to cause a permanent set(elongation) equal to a specified percentage of the original gauge length. What is Plastic Strain ? It is a dimensional change that occurs in a material due to application of the loads and does not disappear after the removal of the loads. The long term deflection due to sustained (constant) loads. What is Factor of Safety ? What is Margin of Safety ?